...... more efficient. Most of the quotation, invoice and reminder tasks can easily be automated within the software, giving you hours more free time. The more quotations and invoices you make, the more time you save! A scalable business system that can meet the demands from most small businesses. 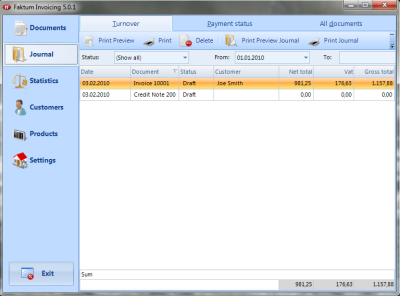 Automatically create Monthly, quarterly, Semi or Annual Billing. Qweas is providing links to Faktum Invoicing 5.4.7 as a courtesy, and makes no representations regarding Faktum Invoicing or any other applications or any information related thereto. Any questions, complaints or claims regarding this application Faktum Invoicing 5.4.7 must be directed to the appropriate software vendor. You may click the publisher link of Faktum Invoicing on the top of this page to get more details about the vendor.